Today my parkrun trail took me down to the seaside and to Lancing Beach Green parkrun. This would actually be my second attempt to do this one - I came here last week only to be told that it was cancelled because of the weather. The result was a frantic dash along the south coast and I arrived just in time to take part in Hove Promenade parkrun. I was slightly nervous about making the trip again today as the weather forecast wasn’t too great so I was relieved when I got there to see the volunteers setting up the course. Lancing is on the Sussex coast, squeezed in between Worthing and Shoreham. It is part of that long coastal strip between the South Downs and the Channel that runs from around Chichester out as far as Brighton. There is evidence of settlement here going back to ancient times and there are still traces of Roman villas, such as the one at Fishbourne, which used to line this shore. 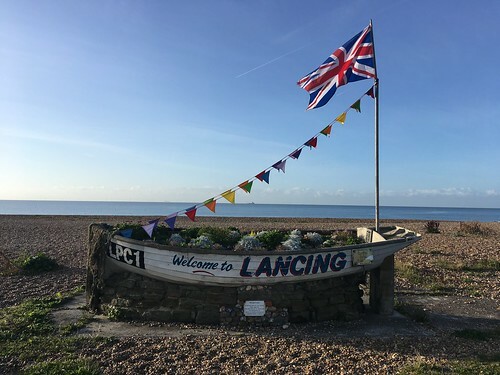 The derivation of the name Lancing ... well the “ing” bit, as in Worthing or Hastings implies “people of ...” Presumably there was an Anglo Saxon tribal chief whose name was Hlanc or Wlanc. Lancing was a fairly inconspicuous village for much of its’ history. In the nineteenth century the rich soil along this strip made it a centre for market gardening. In later years large glass houses were built to grow more exotic fruit and vegetables, such as tomatoes and grapes. Flowers were also grown in the fields here and packed up to be sent off to Brighton Market or up to Covent Garden. In later years this industry has largely disappeared and the fields have been replaced with housing estates and business parks. In the nineteenth century seaside holidays became popular and Lancing tried to attract visitors to the South Coast. There were some well known visitors to the town including Oscar Wilde - Lady Bracknell in ‘The Importance of Being Earnest’ was originally to be called Lady Lancing. 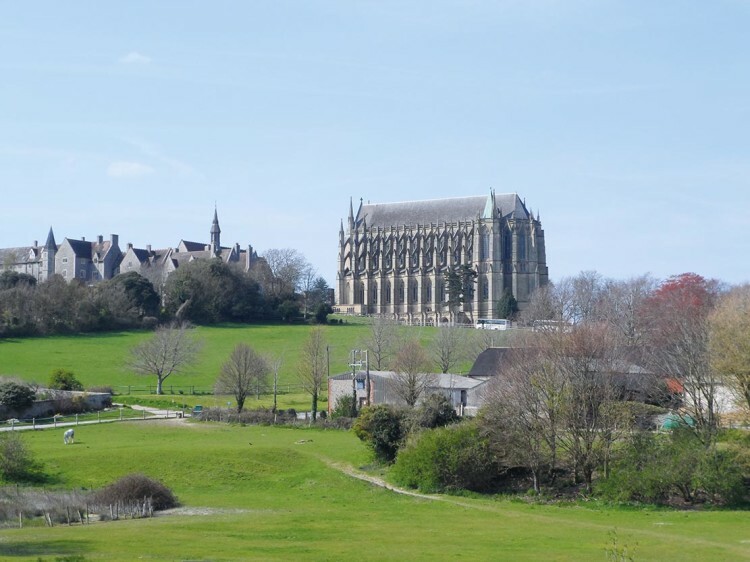 Overlooking the town on a hill to the north is Lancing College. Lancing was founded in 1848 and is one Britain’s most prestigious (and most expensive!) independent schools. The school has produced a huge number of boys (and nowadays girls) who went on to illustrious careers. The most distinctive feature of the school buildings is the huge, vaulted chapel which stands atop the hill. I’m not sure who would go to Lancing for their holidays these days. When you drive up to the seafront you are met not with a grand pier or a brightly lit amusement park but with a tyre centre. The place has some of the features of a seaside resort - beach huts, caravan parks etc. There is a rather nice café on the seafront with large glass windows so that you can sit and watch the gales blowing through the English Channel. The beach also seems to be a centre for kite surfing. The course at Lancing is a double out and back. You start on the grass then run the length of the green, maybe 400 metres, then turn round and come back. You then turn on to the concrete path at the back of the beach and run along the promenade for two kilometres or so and then turn back to finish back at the green. The weather was rather bettter than it was last week but there was still a very strong wind blowing which would be in our faces on the return leg. Maybe the weather or perhaps the need for Christmas shopping reduced numbers today to 77 starters, well below their average. We set off across the grass and for the first part it was very easy as we had the wind behind us. We then turned round at the end and suddenly it was a lot harder into the wind - a foretaste of things to come. I was at the front of a small group as we came back on to the promenade. On the firm surface and with the wind behind me I picked up the pace and, to my surprise, found myself running on my own in first place. Well there was no point in waiting for them to catch up so I pushed on and reached the turnaround point in just under 11 minutes. I was wondering how much lead I had and I could see at the turnaround it was about thirty seconds. The second half was much harder. Suddenly I was running into the teeth of that wind. Sometimes it seemed like I was running in slow motion. I could see the landmarks ahead - the beach huts, the sailing club, the café - but it took an age to get there. I was worried the group behind might catch me but there was no sign of them as I reached the final turn and I crossed the line first in 19:55. A bit slower than I had hoped for but I was pleased to register my third first place finish. So I was pleased to have finally have made it to Lancing and I’d recommend it to anyone else. It has a lovely seaside setting, it has nice facilities near the start and finish, and, as long as it’s not blowing a gale, it could be a pretty fast course. My statistics for today - that was parkrun venue number 186. I was first overall, first in my age group and first on age graded scores. I shall finish as usual with a YouTube video of the course. If you’d like a short glimpse of the event, here it is.